We exploit the versatile framework of Riemannian optimization on quotient manifolds to implement R3MC, a nonlinear conjugate gradient method optimized for matrix completion. The underlying geometry uses a Riemannian metric tailored to the quadratic cost. 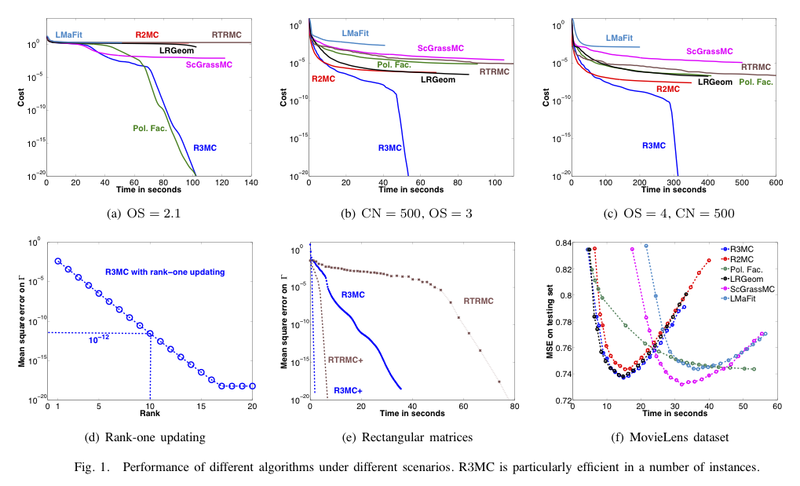 Numerical comparisons suggest that R3MC robustly outperforms state-of-the-art algorithms across different synthetic and real datasets especially in instances that combine scarcely sampled and ill-conditioned data. Status: Published in the proceedings of the 53rd IEEE Conference on Decision and Control, 2014. Matlab code: R3MC_17feb_2017.zip (updated on 17 Feb 2017: excluded the time used for computing the test predictions). Entry: June 13, 2013: The code is online.